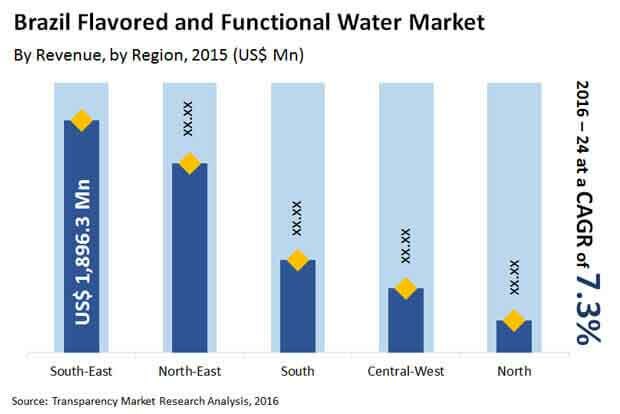 The Brazil flavored and functional water market has been anticipated in a report by Transparency Market Research (TMR) to testify the presence of a significant count of small and domestic as well as large companies operating in the industry. Some of the leading companies of the market are Groupe Danone, PepsiCo Inc., and Nestle Waters. During the completion of the forecast tenure 2016-2024, the competitive rivalry among prominent companies has been foreseen by seasoned market analysts to stay high. In order to gain a competitive edge over other participants in the market, companies could take to focusing on product advancement and operational expansion. TMR has prognosticated the Brazil flavored and functional water market to rise at a 7.3% CAGR to be worth a US$9.4 bn by the final forecast year. On the basis of segmentation by ingredient, the market could witness the rise of vitamins and minerals as a leading segment expected to post a 7.1% CAGR with respect to volume. In terms of geography, Southeast Brazil has been predicted to collect a strong share of 38.2% by the concluding forecast year. The development of the Brazil flavored and functional water market has been foretold to gain momentum from gradually increasing inclination of consumers toward healthier low-calorie beverages and reducing interest in sugar-sweetened carbonated drinks. According to the author of the report, the market could gain from increasing awareness about maintaining a good wellbeing at all times. Rising knowledge about how carbonated drinks could cause heart burn and weight gain as a result of digestive issues due to the presence of phosphoric acid and caffeine could also help flavored and functional water to gain traction in Brazil. Manufacturers operating in the Brazil flavored and functional water market could find it tedious to individually recycle and dispose containers and packages that pose environmental threat to the country. Furthermore, tight packaging regulations have been expected to create a moderate threat to the growth of the market in the coming years. This could be evident with the Brazilian Association of Technical Norms (ABNT) making it mandatory to get polyethylene terephthalate (PET) bottles, cans, and all other consumer packaging certified. However, swelling demand for energizing, healthy, and convenient drinks and improving per capita consumption of flavored and functional water have been projected to set the tone for a valuable growth in the Brazil market.